Streetglow H7 (55w) DOT Legal Xenon Headlight Bulbs5Vinny OOctober 13, 2010I previously had bought some super high wattage bulbs that were like 120 watts from autozone and melted my wiring harness. I won't make that mistake again. These 55 watt bulbs have not melted or damaged my wiring harness and are brighter than the factory bulbs at a fraction of the cost of what some of the other guys charge. I may get brave and move up to the 70watt, the guys at New Level said I should be fine with the 70 watt and they also offer a harness for them to be extra safe for an extra 15 bucks. These are getting the job done for me in the meantime though and i'm happy. Streetglow H7 (55w) DOT Legal Xenon Headlight Bulbs4PhillyApril 2, 2010I bought this lower wattage because I was worried about putting the 70 watt in my car since my car only had a 45 watt from the manufacturer. These are nicer than the oem bulbs and a great value for the money, but my friend got the 70 watt and they are more bright enough to notice. He isnt having any problems with them so I will probably upgrade to those next paycheck. Streetglow makes great stuff. 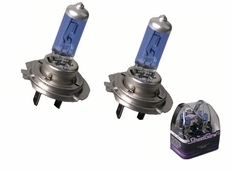 Streetglow H7 (55w) DOT Legal Xenon Headlight Bulbs5MiFebruary 24, 2010For the inexpensive price that these are, they are much whiter than stock bulbs. Worth every penny. Streetglow H7 (55w) DOT Legal Xenon Headlight Bulbs5graffiti600May 7, 2009I have an 08 CBR600rr that I had some silver star bulbs that didn't work out nearly as good as these bulbs do, these street glow head lights are much brighter and a hell of alot more cost effective.